1. After your hair is freshly cut and styled, take a photo with the “Cutting Up for the Cure” sign. P.S. Please remember to wear your make up and accessories the day you want your photo taken! Stop by the salon and party in PINK! PINK Punch,PINK Cookies and PINKPrizes… just purchase a $10 raffle ticket and your name will be entered in our drawing! All proceeds will be donated to Susan G. Komen for the Cure! Susan G. Komen donations go to www.komen.org. 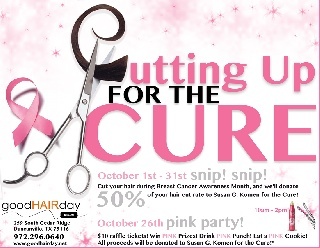 * Disclaimer: All hair cuts must be paid in full before 50% donation will be made to Susan G. Komen. Photos will be posted on the internet and a photo release must be signed. Raffle ticket purchases do not gaurantee prizes. Names will be drawn and the winners will receive prizes. Need not be present to win. Raffle tickets can be purchased the entire month of October. Winner’s will be announced on October 26th. Participating Stylists.